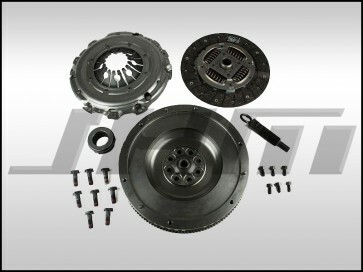 This is a brand new single-mass flywheel conversion and clutch to upgrade your manual transmission 2.7t Audi. Purchase this kit if you would like to replace your failure prone, dual-mass flywheel with an upgraded, single-mass flywheel and brand new clutch disc with pressure plate. This single-single mass flywheel conversion clutch kit is made by Valeo, an original equipment supplier for many OEM Audi parts. FITMENT: This upgraded clutch and single mass flywheel fits on the B5-S4, C5-A6, and C5-allroad with a manual transmission and a 2.7t. - 1x Clutch alignment tool. NOTE: Flywheel to Crankshaft bolts must be torqued to 45 ft lbs plus an additional 90 degrees. Pressure plate to flywheel bolts must be torqued to 18 ft lbs and JHM recommends the use of loctite as well.